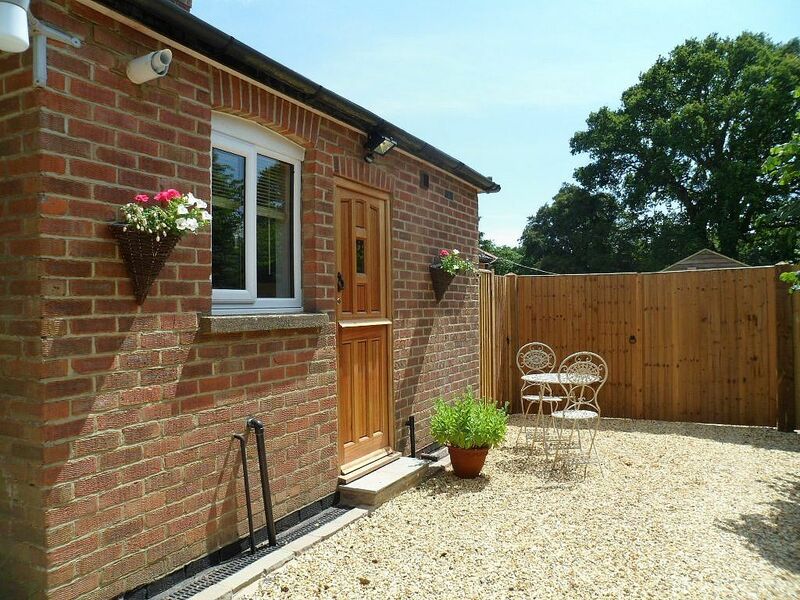 Bungalow in Wootton, New Forest, Rural, Peaceful Location, perfect for forest walks but still close to lovely beaches. Twistlewood is a highly desirable,comfortable,bright and airy accommodation, tastefully furnished throughout.and decorated in calm rural tones.Set in a peaceful location Wootton is approx. 1/2 a mile from the village of Bashley where you will find a Post Office/shop petrol Station,2 Garden centres,and 2 very good farm shops. Venture further afield and you will find the town of New Milton with a well appointed High Street with Banks, Supermarkets and gift shops. A main line Train Station and an excellent bus service to take you around the forest. Just 8 miles away you will find the Georgian town of Lymington with plenty of shops, bars, cafes and restaurants. The beaches of Barton on Sea, Milford on Sea, Highcliffe and Mudeford are all within easy reach. Hi We are Kelvin & Kay and we have spent many happy holidays in the New Forest, 5 years ago we decided to take the plunge and move away from the hectic county of Surrey. We were very fortunate to have found Twistlewood and have wasted no time in sorting out the garden, and orchard.We also have 5 ducks which have been laying well and many guests have enjoyed the eggs. Kelvin enjoys cooking and baking cakes, you may be lucky enough to taste his Dorset apple cake. We are an easy going couple and when we have time enjoy visiting our local pubs and restaurants. We chose this location for its rural feel and closeness to the beaches at Barton on Sea and Highcliffe. New Milton High Street has all we need on a daily basis or we can get to Bournemouth or Southampton if we want to. At Twistlewood you can enjoy peace and quiet, hear the birds sing from dawn to dusk, unwind and relax in the tranquil setting. Enjoy the well appointed kitchen facilities or head out to one of the local pubs for your meals and after a long day exploring the Forest you can return to Twistlewood and pamper yourself in the beautiful shower room. A fully tiled large walk in shower with thermostatically controlled LED shower head, Wall hung toilet & Vanity unit, heated towel rail, Large mirror, Extractor fan, Shaver socket, Supply of toilet rolls, Fresh towels and bathmat. Close to the popular beaches at Barton On Sea, Milford On Sea and Mudeford. On the track outside Twistlewood, or along side the annex off the track if you prefer. A welcome basket of breakfast items and fresh fruit is supplied for your enjoyment. Very well appointed kitchen with all the utensils required that you might need. Table for two located within the fully fitted kitchen. Cledia , Thank you for your comments and glad you made the most of the welcome basket, and that you enjoyed the peace and quiet that you get when staying at Twistlewood, hope you feel rested and more relaxed now , and you will come back again to stay with us. Excellent location, very accommodating hosts with a lovely surprise breakfast hamper! We would definitely stay again! many thanks for you kind words, we do try and make your stay as comfortable as possible and I enjoy spoiling my guests with my hamper and am pleased you liked the Jam, ( my first attempt ) ! Thank you for leaving the annex so clean and tidy , we are delighted you enjoyed the peace and quite of our location, with the horses and cows wandering by, and hope you will tell your friends and return to visit again. Situated in a quiet and peaceful location within the New Forest National Park with ponies and cattle wandering past. The welcome basket provided by Kay & Kelvin was a very thoughtful and much appreciated unexpected extra. We found Twistlewood to be ideally situated for exploring both the forest and the nearby coast which is approximately a 10 minute drive away. We particularly enjoyed the peace and quiet away from the hustle and bustle of everyday life and would love to return in the future. Thank you so much for you nice review we are so pleased that you had such a nice time staying in Twistlewood Annex, and were able to enjoy the peace and tranquillity of our location , and that you enjoyed watching the cattle and ponies go by for the comfort of your chairs. It gives us pleasure to know that you have enjoyed your stay so much and we would be delighted to have you return to stay again one day . A enjoyable stay at Twistlewood. Kay and kelvin where very welcoming. The accomadation was just as described,very nice. The added bonus was firstly the breakfast hamper but as well some lovely homemade apple cake. The holiday annex is also in quite a central location so it was only a short drive to all the different areas to visit. Many thanks for your review , we are glad you enjoyed the home comforts of Twistlewood, and its great location close to the beaches made it possible for Ian to do his Kite Surfing, and you both to enjoy some of the great forest walks we have on our doorstep. Hope you will return one day soon. Brilliant location near to beaches and villages with peaceful surroundings just right to unwind and relax. We are so pleased that you enjoyed the lovely location that we live in,and were able to visit all the places that you wanted . We like to make your stay special and hope that you will recommend us to your friends and come back to visit another time. Had a lovely stay in the annex. It was well equipped and cosy and the owners were very welcoming and friendly. Great location right in the national park and close to lots of great biking trails. We are pleased you enjoyed your stay with us, and were able to use some of the fantastic cycle trails we have on our doorstep, along with the coastal walks. The National park is a special place to visit and looks so much better when the sun shines and you were very lucky with the weather. We hope you will return again. Bournemouth and Southampton airports are less than 15 miles away. A car is recommended to reach us, just off the A35 on the B3058. There are plenty of things to see and do in the New Forest, leading attractions such as The National Motor Museum at Beaulie, Exbury Gardens and Steam Railway, Bucklers Hard, Highcliffe Castle to name but a few.Fishing trips are available from both Lymington and Keyhaven and a car ferry runs from Lymington to Yarmouth on the Isle of Wight. Historic bustling towns of Bournemouth, Winchester and Sailsbury are only a short drive away. For the nature lover vast areas of the New Forest have abundant wildlife and plants along with free roaming Ponies, Donkeys, Cattle and Pigs, making it a perfect place to come and enjoy your holiday.